A gourmand & a globetrotter by nature, Vidushi has an evolved palette of experiences along with a comprehensive culinary knowledge, a strong aesthetic sense, & a sharp perspective. Her love for travelling & exploring new cuisines has taken her places; factually to say, over 250 cities across the world but impactful enough, when you weigh down the richness of the experiences, the cultural cognizance, & the flavours she’s gathered on her taste buds. From experimenting with contemporary dessert trends, wearing her mom’s apron in her early teens to volunteering to make desserts for events in school and university, Vidushi realised her calling towards the sweeter side of things quite early. The pursuit of this passion led her to enrol at Le Cordon Bleu London for their prestigious diplôme de patissiere. She grasped the basic knowledge of savoury techniques and attained culinary qualifications side by side. Being in the kitchen for hours on end & learning something on the forefront every day, Vidushi further specialised in Boulangerie and Cake decorating from the same institute. 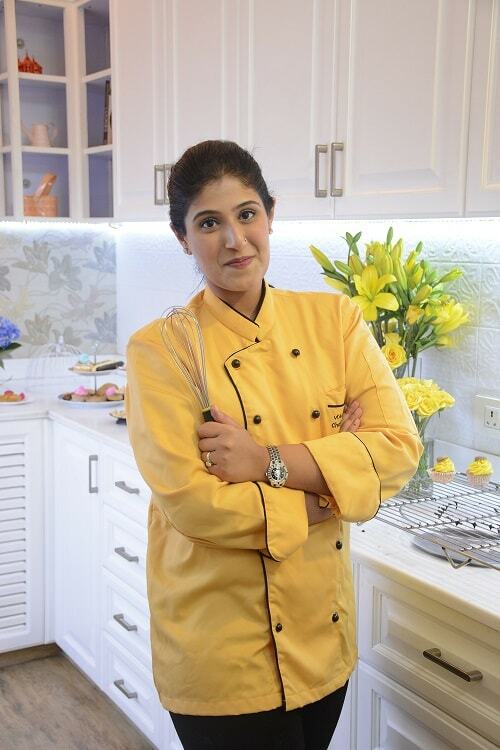 Trained by the best chefs of the world, Vidushi has developed her skills in the niche of French technical pastry and makes delicacies like complex gateaux, entremets, & macarons. Combining unique flavours and experimenting with different techniques & produce, her work holds its own in front of the usual, but that’s not all! She also specialises in revisiting classic & comforting desserts and presenting them in a never-seen-before avatar like revisiting the old Banoffee pie but giving it a very complex French twist or the Tiramisu encased in a Mascarpone, white chocolate & vanilla bean bavarois. After her training at Cordon Bleu, Vidushi has designed and created her own atelier where she perfects her art and takes bespoke orders. She likes to be in touch with industry trends and loves experimenting with new ingredients, ideas & recipes. Be it mastering the decidedly temperamental macaroons or creating quirky entremets with flavours like peach, rose & white wine or blood orange, ricotta & cointreau among others or baking goodies that clearly fall in the category of comfort food like a classic dense chocolate cake, almond praline cake or lemon curd cake. Vidushi has a slick passion about creating new dishes and eating them too and has experienced gastronomy at some of the world’s best restaurants like Gymkhana, La Petit Maison, Zuma, Nobu, Hakassan, Noa, Gaggan and Indian Accent, closer to home. It’s not all high-brow though; she gorges on Jalebis from Shiv Mishthan, Chandni Chowk or Fish at Surjit in Amritsar with as much gusto because flavours, textures & aromas are all that is important to her. She draws inspiration from legends like Angelina, Pierre Herme, L’eclair de genie and Pastry greats like Dominique Ansel, Antonio Bachour, Janice Wong to name a few. When asked about new trends in the F&B industry, she says “It’s a very curious time for the F&B industry in India! Because of more exposure, people are gladly moving towards quirky flavours & extraordinary techniques, the farm to table concept is the new IT thing; alternate grains that have been an integral part of the Indian culture are finally getting their due credit and fun concepts like pop up restaurants are gaining popularity but the most important change is that people are finally interested in knowing the Chef who created their meal and not just the establishment.” With an ambit of creating a selectively-spiced curry of experiences without ‘extra salt or sugar,’ Vidushi is on a trail to explore new tastes, cuisines & concepts across cultures on the spectrums of their literature, texture, & culinary secrets. She believes that honest and personal experiences are worth sharing & should not be directed by pressure or money & thus, pays for all her meals & expenses.